Mouse over the "Website" tab (in the manage toolbar) and click on "Blog". Click on the "Write new Post" button. 5. Select your name in the "Author" drop down (only officers will appear in this drop box) or write your name in "Invited blogger" at the bottom of the page. Note: If you wrote the article on MS Word, please use the "Paste from Word" icon. 7. Add image by clicking the "Image" icon. Then click on 'Browse' and select your image. If you want to add a new photo, click on the 'Upload New Photo' button. 8. If you wish to insert a link, highlight the word you want to link and click on the "Link" icon. 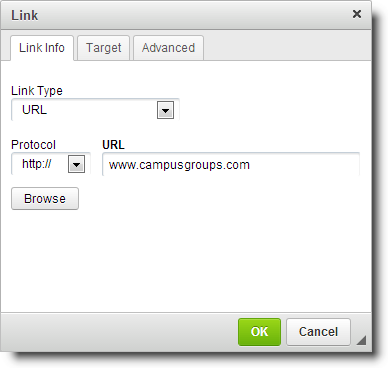 Once prompted insert the URL, then click on the "Target" menu and select the appropriate option. 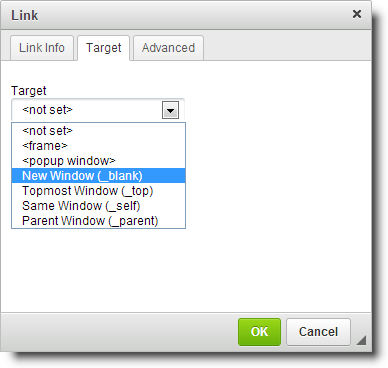 Usually "New Window " is selected so that the link is displayed in a new tab and the user does not navigate away from your page. 9. If you plan to publish immediately, then click "Yes" on publish. 10) Assign tags to your blog in order for it to be published on your website.